Those New Mandala readers who follow the renewed conflict in the Kachin State closely will know that over the past week there has been major escalation of hostilities in the northern Shan State. 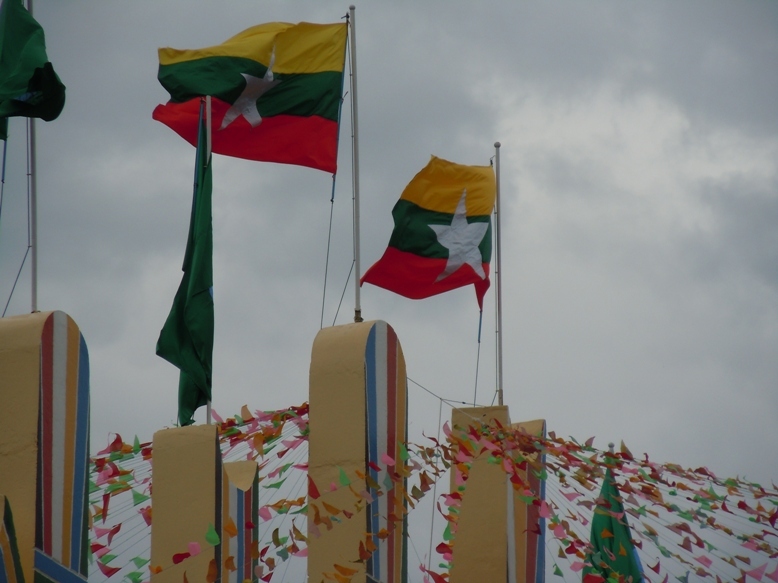 Back in July I provided a post that consolidated reports from The New Light of Myanmar dealing with the conflict. As a modest service to readers I have once again pulled together recent reports. They are listed in reverse chronological order. I expect that once the Burmese authorities are forced to confront exile media reporting about their losses in recent days we could see some very important accounts. Burmese troops, as before, have reportedly made some heavy sacrifices to take Kachin Independence Army bases. NAY PYI TAW, 10 Sept-KIA group set fire to Thaphanpin Forest Office of Bhamo Township Forest Department in Thaphanpin Village, northwest of Bhamo in Kachin State at 10.30 pm on 7 September. NAY PYI TAW, 7 Sept- One innocent civilian was killed and another one injured in the explosion of a landmine planted by KIA (Kachin) group in Waingmaw Township of Kachin State on 3 September. Searching for the lost bull, Maung Lwan Ze of No (3) Ward in Waingmaw and Maung Branmai of Bibra village in Waingmaw Township on 3 September afternoon stepped on the mine planted by KIA (Kachin) group near Tabak creek. Maung Lwan Ze died of leg, abdomen and face injuries. Maung Branmai sustained face and chest wounds. The injured was admitted to Waingmaw Township People’s Hospital and given medical treatment. Not only indigenous national races of Kachin State but the entire people demand KIA to return to legal fold and to join hands with local people in the interest of the state and the Union. They want no more mine blast, forced recruitment, extortion, destruction of the State’s projects, killings, and planting mines in public places. NAY PYI TAW, 4 Sept- Union Minister for Cooperatives U Ohn Myint met staff of Kachin State and township Cooperatives Departments in Kachin State Cooperatives Department this morning and stressed the need for lean, effective organizational structure and corruptionfree procedures. He then visited Weaving Training School, Manaw Ayeya Weaving Industries Cooperative and weaving workshops of Daw Bok Jar in Myitkyina. He then went to Mandalay and met board of directors and members of Seinpan Industries Cooperative in Mandalay Industrial Zone No.2. In meeting with weaving workshop owners and instructors at Amarapura Saungda Weaving Training School, he called for kaizen highlighting the concept-one village, one product. He then visited Yadanapura Myanmar Handicraft and Arts Beikman of Mandalay Region Cooperative Syndicate. NAY PYI TAW, 2 Sept- Chief Minister of Kachin State U La John Ngan Hsai on 30 August comforted those who temporarily stay at Baptist Church in Sitapu Ward in Myitkyina, the Baptist Church in Mankhein Ward and Christian Church in Shweset Ward due to current conflicts. He presented cash assistance, medicines from Health Department, six supply aids from Relief and Resettlement Department, assistance from Myanmar Red Cross Society and books and stationery and school uniforms from education department to them. He also comforted those who temporarily stay at Myoma Christian Church in Ward 2 of Waingmaw,Catholic Church, Lawwaw Church, Mina AG Church, Original Baptist Church, Thayettaw monastery in Madein Ward and Ward 4 and Khatcho Village of Waingmaw Township. The Chief Minister presented cash assis-tance, medicines of Health Department, six supplies from RRD, aids of MRCS, books, stationery and school uniforms from education department to them. On 31 August, the Chief Minister visited Baptist Church in Dukahtaung Ward, the church in Janmaikaung Ward, Baptist Church in Tatkon Ward and Maliyang Church in Legon Ward of Myitkyina, and comforted those who temporarily stay there and gave supplies to them. NAY PYI TAW, 2 Sept- A passenger vehicle plunged down into a creek as the bridge collapsed while the car was crossing the river over the bridge in Phakant Township, Kachin State, leaving one dead and five missing on 30 August. The passenger car driven by U Aye Naung was enroute from Moenyin to Phakant around 8 pm, 30 August when the accident happened. The bridge over Indaw Creek which is 20 ft in depth near Kahtayan Village in Kamine Sub-township was blown up three times by KIA and it was no longer withstand traffic. Drivers repaired the damaged bridge to cross the creek temporarily. Out of 9 passengers on board, three managed to escape from the car in the creek, one dead and five are still missing. NAY PYI TAW, 28 Aug – Kachin State Government briefed on peace and stability of the state at Town Hall of Myitkyina yesterday. Kachin State Chief Minister U La John Ngan Hsai addressed the briefing which was attended by the State Chief Justice, the State Hluttaw Deputy Speaker, State ministers, the State Advocate- General, the State Auditor-General, members of social organizations, officials and locals. Leader of Negotiation Team for Kachin State Peace and Stability State Minister for Security and Border Affairs Col Than Aung explained works for peace and stability of the state, negotiation with KIO (Kachin Group) and current developments. State Social Affairs Minister Daw Bauk Jar elaborated on accommodation of rural folks who fled to urban areas at refugee camps where they are provided with food, health care and education. The chief minister, State ministers, the State advocate-general, the head of State Land Records Department and the secretary of State government then replied to questions of reporters. The chief minister called for collaborative efforts for all-round development of Kachin State, stability, eternal peace and ceasefire. NAY PYI TAW, 19 Aug-School Health Week Activities of Kachin State took place at No.1 Basic Education High School in Myitkyina on 13 August. Chairman of Kachin State Peace and Development Council Commander of Northern Command Maj-Gen Soe Win made an opening speech. After that, the commander and officials presented awards to the schools that won school health awards. The commander and officials inspected school health booths, feeding nutritious meals to children and fumigation in the school ward. The commander left necessary instructions. Wonder what sort of influence the conflict has had on the Myitsone dam cancellation. They don’t care about the Kachin or any other group for that matter. Even the gathering momentum of protest among the majority, whilst it seemed to have largely contributed to the govt’s surprise decision of suspending the Myitsone Dam Project, my hunch is the growing dissent inside the Tatmadaw and govt that forced their hand as the political situation continued to deteriorate. Burmanisation of the region along the Ledo Road by resettling people in new villages with ex-army NCOs as headmen has already been tried. A new regional military command (RMC) is likely being established there at Tanaing to split the Kachin east and west. The strategic aim is to secure their own and Chinese investments in Kachin State, not least to keep the Asian Highway open between India and China across the northern Burma corridor. They can expect both Indian and Chinese collusion in achieving this at the expense of the Kachin however short-sighted it may seem to the rest of the world regarding long term stability and sustainable development of the region. Given that the KIA has been stopping Chinese trucks carrying building material from crossing into Burma, and the dam is one of the caus belli, I suspect the conflict might have some influence on the decision. Sure, the government might not care about the Kachins, but the Kachins have a bit of agency too, in the form of bullets, so that has to play some role. I can’t help but think that the fighting may have inadvertently opened a bit of political space for Thein Sein. Sure the KIA’s actions contributed to an extent as did popular protest. I’d still maintain the more likely principal agency at this juncture must have been an ominous crack appearing over the river in their ranks big enough to override Chinese and their own economic interests. If I were completely cynical (not a bad default position to start from when discussing politics), I’d point out the fighting and the suspension might justify some re-negotiations of deals with China on more favorable terms. Why yes, they could capitalise on this decision which they already have in order to enhance their ‘democratic credentials’. And like you said, grab an opportunity from the crisis to renegotiate with China. You underestimate these guys at your peril. Not only have they managed to defuse a potentially explosive situation, they got brownie points from the ‘international community’ as well as getting themselves in pole position vis-a-vis the Chinese. Some brinkmanship of sorts you might say vis-a-vis the West too, like they’d done it with the Kokang Incident to the Chinese leading to their subsequent brokering of a new ceasefire deal with the UWSA in order to isolate the KIA.